As a small business just starting out, you need to build trust with your audience—especially since you lack the credibility that comes with being in business for many years. One way to do this is to have an email address that ends with your business name (ex: yourname@yourbusiness.com). Gmail for business (G Suite) lets you create a professional email account for $5 per month. This is a great option for businesses with multiple employees because of the amount of storage they offer, the admin capabilities, and 24/7 customer support. If you have fewer than 5 people, however, consider combining your email with your web host provider. Bluehost offers domain name registration, website hosting, and up to 5 free email addresses for $7.99/month. If you already have a website, switching hosts is easy. To help you get started, FSB readers can sign up for just $2.95/month. What are the Benefits of Using Gmail for Business? Having an email address that matches the name of your company and company’s website demonstrates to potential customers that you are a legitimate and trustworthy business. Besides having your domain name in your email, the main difference is the admin panel where you will be able to administer all of your users, tracking reports, and data migration. Email Account Ownership – You will own all of the email accounts, not your employees. 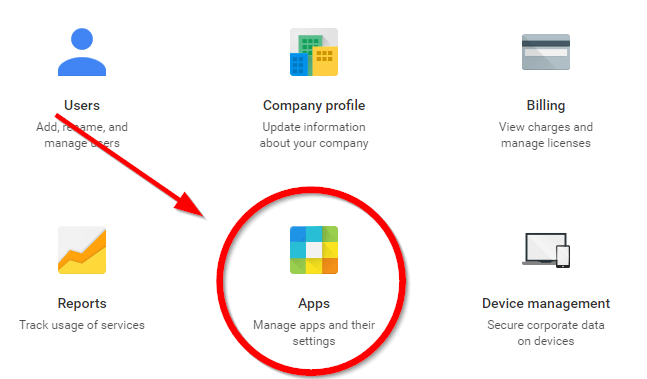 Therefore, if someone leaves your company, you can turn off their access so that they will no longer be able to access contacts, emails, private information, etc. File Ownership – You will also control all of the files created within G Suite, such as Google Docs, Sheets, and Slides. You can view these even after an employee leaves the company. Document Sharing – It is easy to share files within the company. The document creator can allow different users access and choose what type of editing power they have. Group Email Addresses – You can create email addresses such as info@yourcompany.com at no additional cost. You’ll be able to choose which users have access to these groups. More File Storage – The paid version has 2x the amount of storage than the free version, with 30GB per user. Extra Security With 2-Step Verification – If you want to implement extra security measures, you can require your employees to implement 2-step verification. This will require them to have a code texted to their phone when logging in from an unknown device. Support – With Gmail for business you have access to 24/7 phone, email and chat support. With free Gmail, you only have access to the self-help support documents. 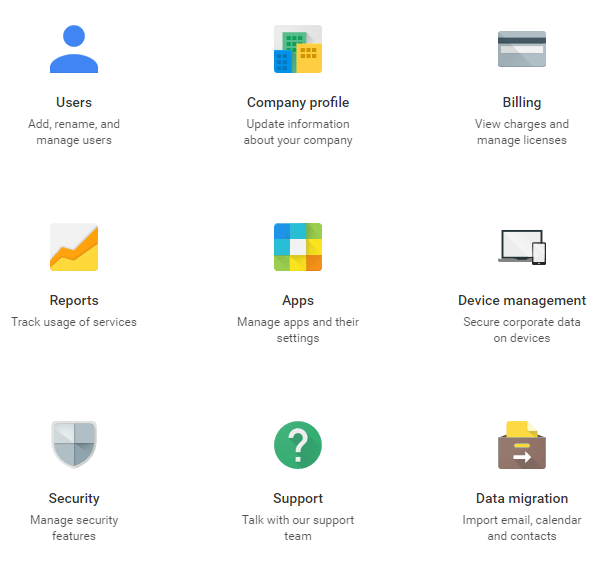 All of these benefits are included in the $5 per month cost of G Suite. However, if the benefits mentioned above are not important to you, then you can save money by setting up a free business email address through your web host provider. View our in-depth guide to learn how to set this up. If you don’t already have a domain name, choosing one is the first step in creating your custom email. Use the name search widget from Bluehost below to find and register a domain. You may have to go through a number of names that are already taken before you find one that’s available. If you do already have a domain name and website, it’s a good idea to check with your web host to see if a free email address is included in your plan. If it is, you can follow this guide for setting up a business email address through your web host provider. 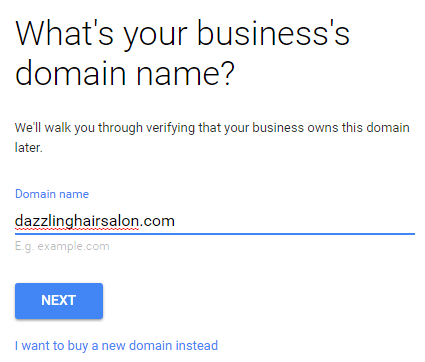 Another option is to register your domain name directly through Google as you’re signing up for Gmail for business. This will be an easier process (since you will be able to skip step #3); however, it will be slightly more expensive ($12 per year). View our guide on the best place to register a domain name to learn more about where you can find less expensive domain name registrars. Once you have your domain name, go to the G Suite website, hit the “Get Started” button on the top right, answer a few questions about your business, and then enter your domain name. Next you will be taken to a page where you can add all of your employees that need a professional email address. You can set this up now, but you will also have a chance to add employees after you finish the process. When choosing the email address format, you want to consider using a standard format for all users. View examples of different email address formats and when it’s appropriate to use each type to determine which format is right for your business. If you did not register your domain name through Google, you will have to verify that you own the domain that you want to use in your email address. In order to do this, you will need to enter the MX records that G Suite provides into your DNS. We will provide instructions based on how to do this with Bluehost, but the process will be similar for all domain registrars. In Bluehost, you will click domains at the top, and then hit the zone editor. 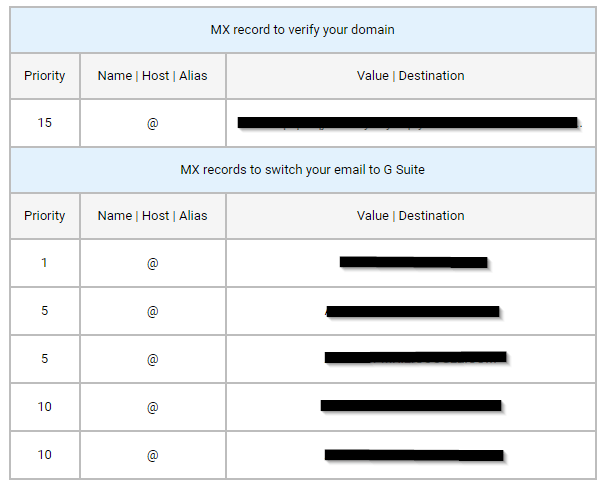 You will then be able to add the MX records by selecting your domain, and entering the information provided by G Suite. You will then need to delete any MX records that were already listed. 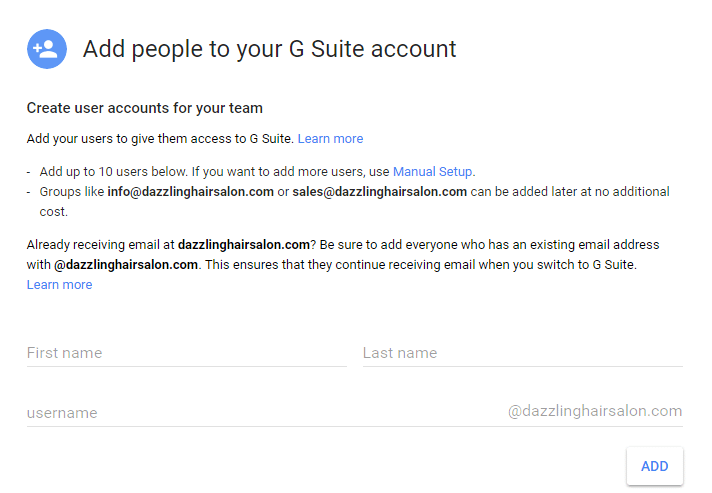 After you hit save, you have successfully set up your G Suite account! It took about 2 hours for emails to start hitting my inbox, but G Suite says this can take up to 48 hours. You will receive an email when your inbox is ready to go. You have already set up your account, but the free trial only lasts for 14 days. Therefore, if you want to maintain access to your account, you will need to choose and pay for your plan. Notice that the cost is per user. A user is defined as a personalized email address. For example, jack@yourcompany.com and jill@yourcompany.com will be two separate users. You can set up a group email address, such as info@yourcompany.com for no additional cost. If you are fine with 15 GB of storage and don’t need to be able to administer user emails, then you may be better off setting up an email address for free using Bluehost. In this guide we show you how to do this, plus walk you through how to link the free business email address with the free version of Gmail. G Suite Basic is suitable for most businesses. 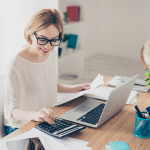 The main difference between the two options is the amount of storage offered, so if you need more cloud space you may want to upgrade to the G Suite Business plan. Once you have your account setup, you may want to migrate your existing emails and contacts into your new account. To do this, first head to your admin console and click on Apps. Click on G Suite > Gmail > Advanced settings. Then hit the box next to user email uploads. You will then be able to go to Gmail > Settings to start the import process. Having a business email address is an important step to making your business appear more professional. 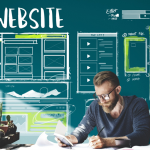 After you’ve completed this, it’s time to take it a step further by creating your business website. View our guide on setting up a WordPress website in under 30 minutes to get started. If you are interested in a less expensive alternative to Gmail for business, view our guide on how to setup your business email address for free. If you own a growing business or if you’re a heavy Gmail user, a free Gmail account may not be enough for your needs. You can benefit by making the switch to a G Suite email account (Gmail for Business). To start using G Suite email, you first need to sign up for G Suite. The process includes choosing or purchasing a domain name. If you elect to use a domain name you already own, you need to verify your ownership of that domain and configure its MX records to point to Gmail.